In front of a crowd of 51 600 spectators in Höljes, Johan Kristoffersson managed to repeat his grand victory from last year – yet another Magic Weekend for the PSRX Volkswagen Sweden driver. ”When I won my home event for the first time last year I knew that I would never forget that feeling and I wanted to feel it again” said a delighted Johan. In perfect summer weather, Höljes once again showed itself from its best side and over 50 000 rallycross fans came to the famous track in the north of Värmland county in Sweden. 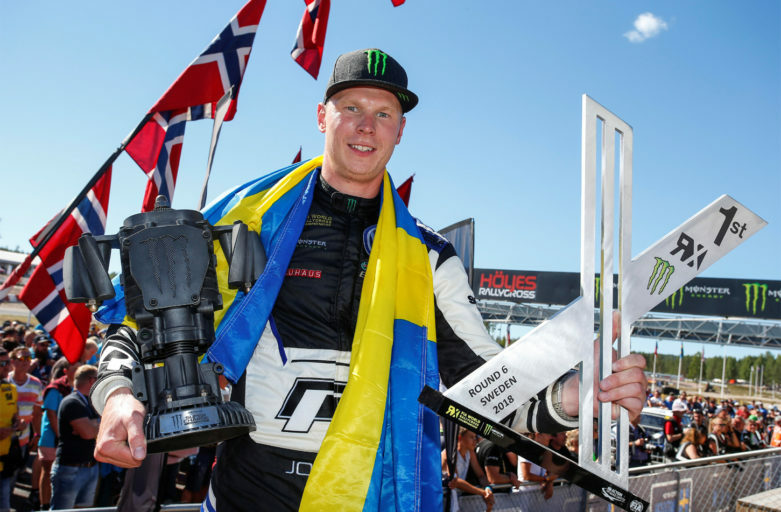 Many of them came to see if the leading World RX driver Johan Kristoffersson could repeat his triumph from last year – and he definitely could! Johan began his weekend in a brilliant way by being quickest in the first two qualifying heats, but he still felt that he had more to give. Johan’s Volkswagen Polo R Supercar looked like it had magnetic contact with the surface and he could get the most out of it without the slightest problem or mistake. After a dominant win in the semi-final, he was in pole position in the final and was off to a great start. ”The launch worked flawlessly, I immediately flew into the lead. And with that I also got the Monster Super Charge Award. That’s something I’m extra happy for since it was my first since France last year” said Johan, who despite having five victories in six rounds this season still hasn’t been the quickest one in the start. Now that he also nailed the start, nothing could stop the Swede. After six controlled laps he was greeted by fireworks at the finish line, which he crossed three seconds before Andreas Bakkerud. After ‘The Magic Weekend’, Johan extends his lead in the Drivers’ Championship with 40 points and PSRX Volkswagen Sweden leads the Team Championship by 42 points ahead of the summer break.